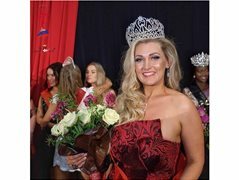 Red Carpet Ball Entertainment Ltd. is inviting the most ambitious and interesting ladies to participate in online selection stage "Miss Russia – New Zealand". If you want to have an unforgettable experience, to feel like a beautiful model or start a modelling career.... and think that you are the best representative of Russian culture and proudly willing to bear the title of "Miss Russia", it is time to apply! Do not miss this opportunity! Contestants must be 18 years of age and older, there are no external constraints. The competition is open to all Russian-speaking girls from the Soviet Union or the girl with Russian roots, living in the territory of New Zealand. Those wishing to participate please leave your application and send us a 3 a good quality your photos. Actual event will held at the beginning of April 2019 in Auckland, NZ. An unforgettable journey into the world of fashion, elegance, beauty, and culture, awaits all participants! This will leave all with the most vivid experience of a lifetime! We are waiting for you to celebrate an important event in the Russian-speaking New Zealand society. MAIN PRICE: trip to Australia for Final Miss National Australia or trip to other countries to represent New Zealand in an International beauty pageant. Welcome!